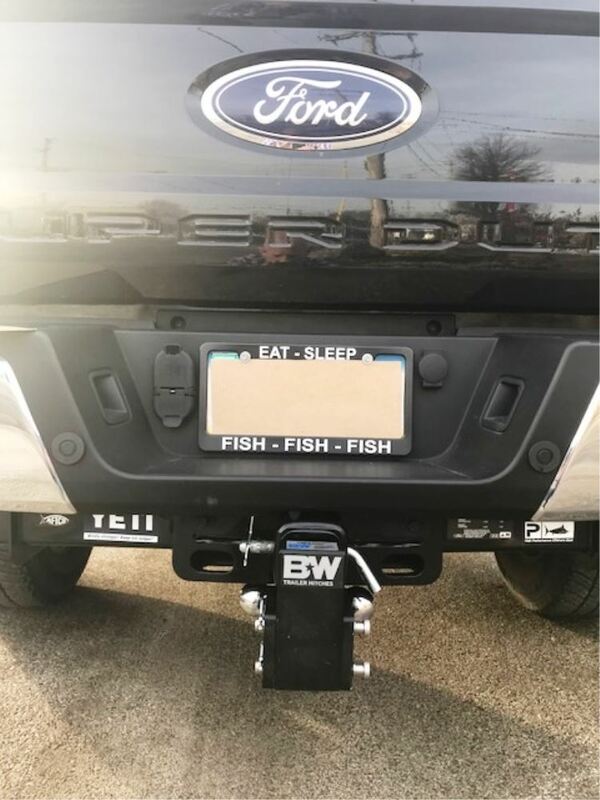 Easily stow the ball and mounting platform on this heavy-duty, dual-ball ball mount beneath your hitch for a sleek look when you are done towing. Tow up to 3,500 lbs with the 1-7/8" ball or 7,500 lbs with the 2" ball. 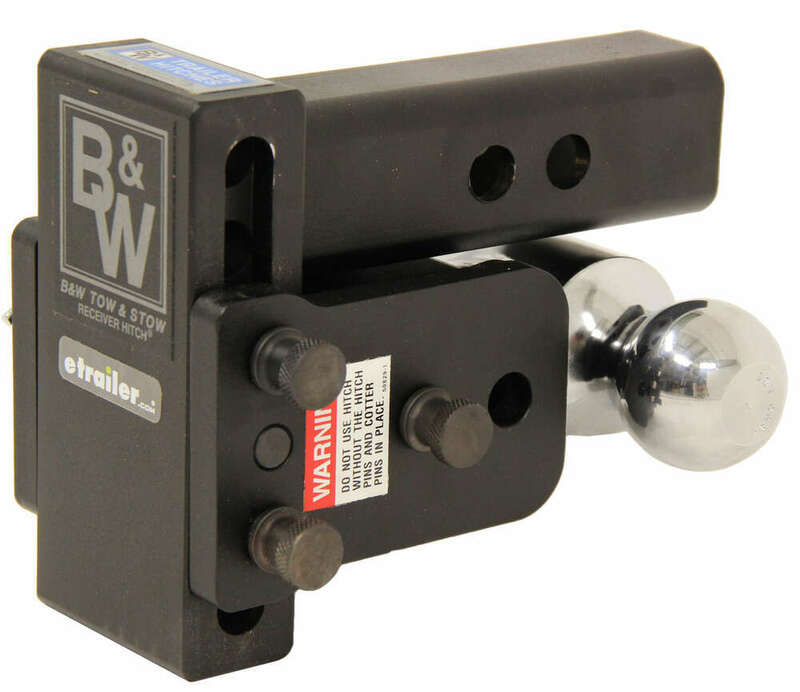 Call 800-298-8924 to order B and W ball mounts part number BWTS10035B or order online at etrailer.com. Free expert support on all B and W products. 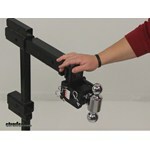 Guaranteed Lowest Price and Fastest Shipping for B&W Tow & Stow 2-Ball Mount - 2" Hitch - 3" Drop, 3-1/2" Rise - 7.5K - Black. Ball Mounts reviews from real customers. 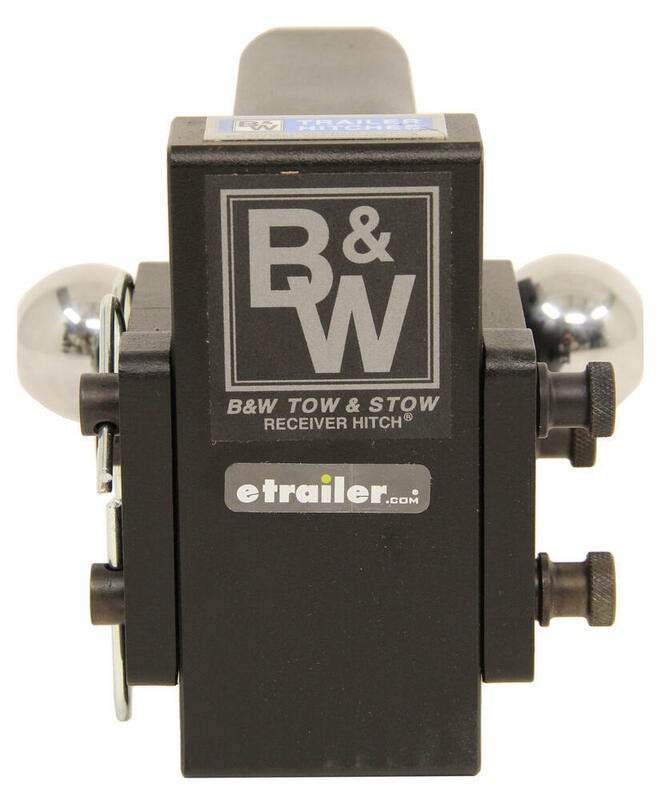 The B&W Tow & Stow adjustable ball mount lets you tow a variety of trailers with different tongue heights. 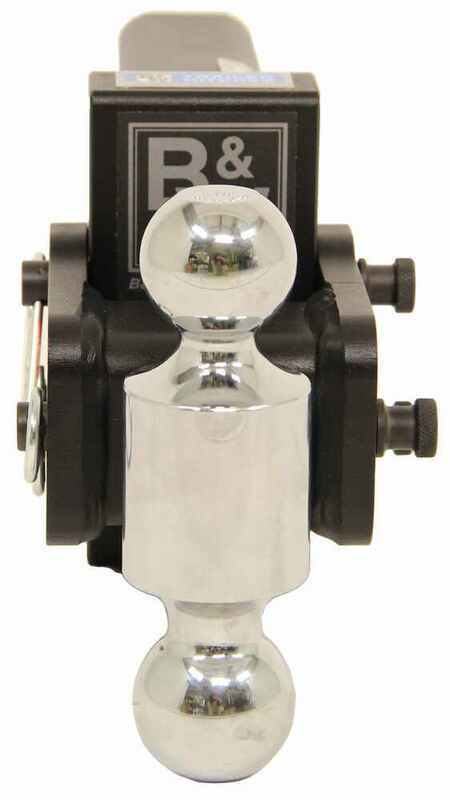 Having both a 1-7/8" ball and a 2" ball allows for even more versatility, making this the ultimate go-to ball mount if you own multiple trailers. Today, we'll be reviewing part number BWTS10035B. 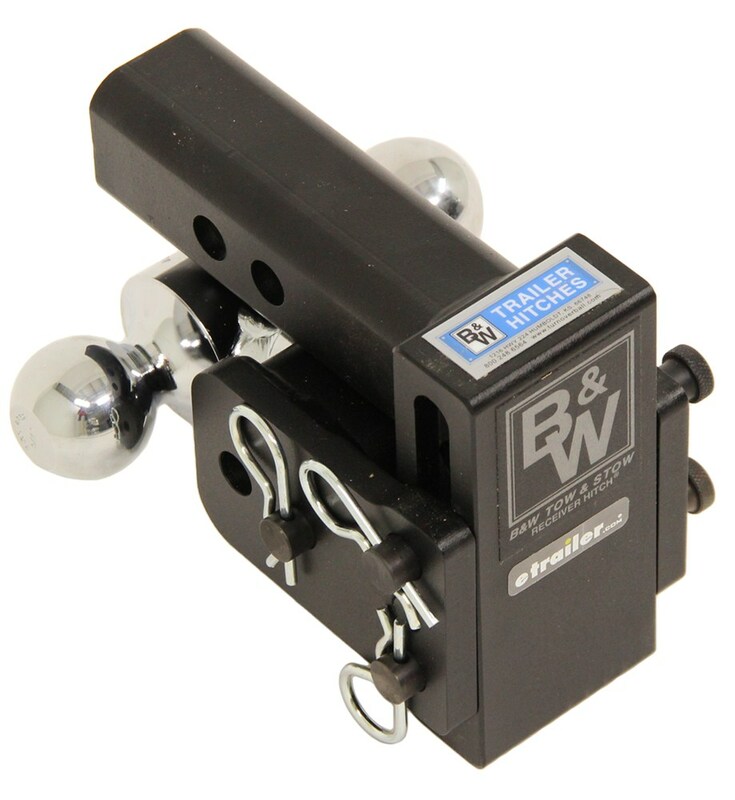 This is the B&W Tow and Stow two ball mount for two inch hinges providing a three inch drop or a three and a half rise rated at 7,500 pounds. 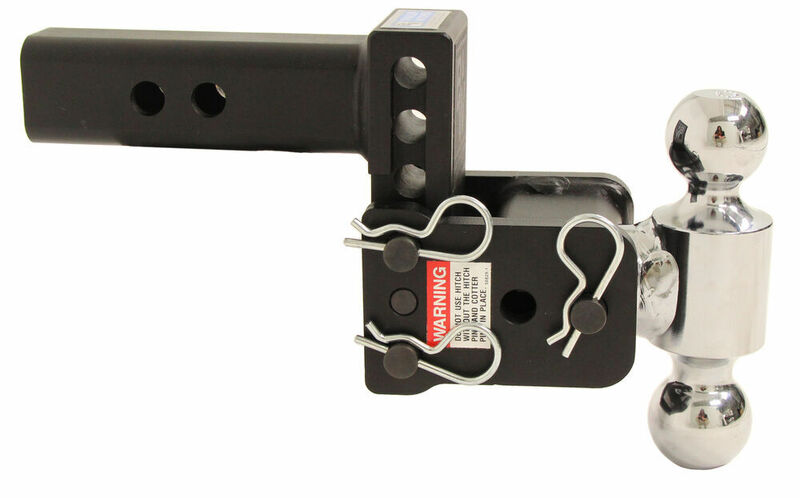 Now, this ball mount does have two different hitch pin hole locations to best suite your towing application. We'll go ahead and slide this into the receiver tube of our hitch and then we can install our hitch pin and lock. Keep in mind that a hitch pin and lock or a hitch pin and clip which what we are using is sold separately and you can refer to that on the ball mounts product page underneath related products. 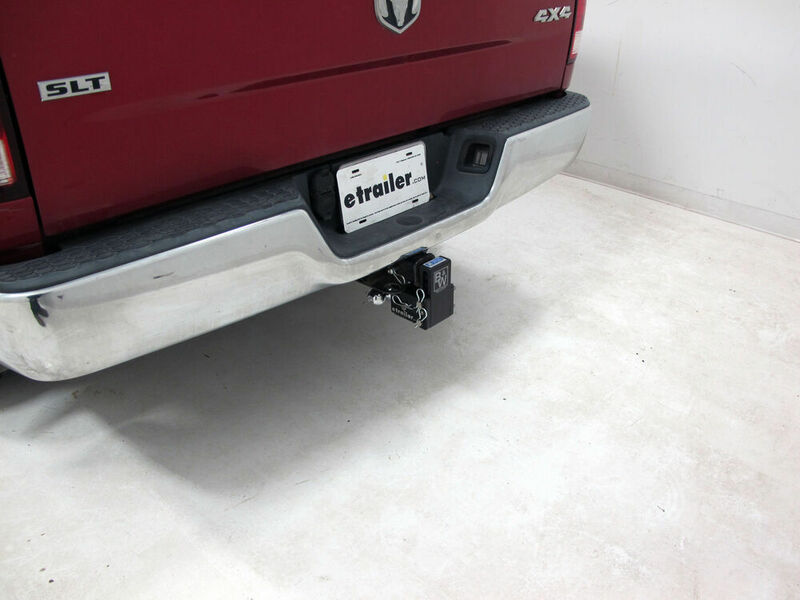 The ball mount with the built in hitch balls lets you hook up your trailer to your tow vehicle. The shank simply slides in to the hitch receiver and then the balls are going to provide good connection points for your trailer coupler. One of the very features of this ball mount is it comes with the stowable design that lets you store the ball and mounting platform underneath your vehicle. 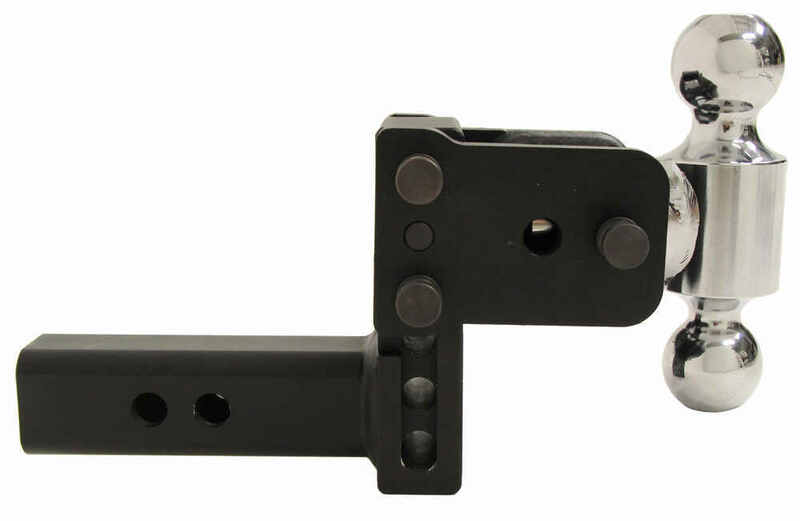 What you need to do is you need to make sure that you have the ball in the flat position, reinsert your pin and clip, and then pull the two back pins, that way we can pivot our ball mount. Once we have it stored, we can then reinsert our pins to finish the storing process. This will help secure everything together and then we would install our clips on the other side as well to finish securing. 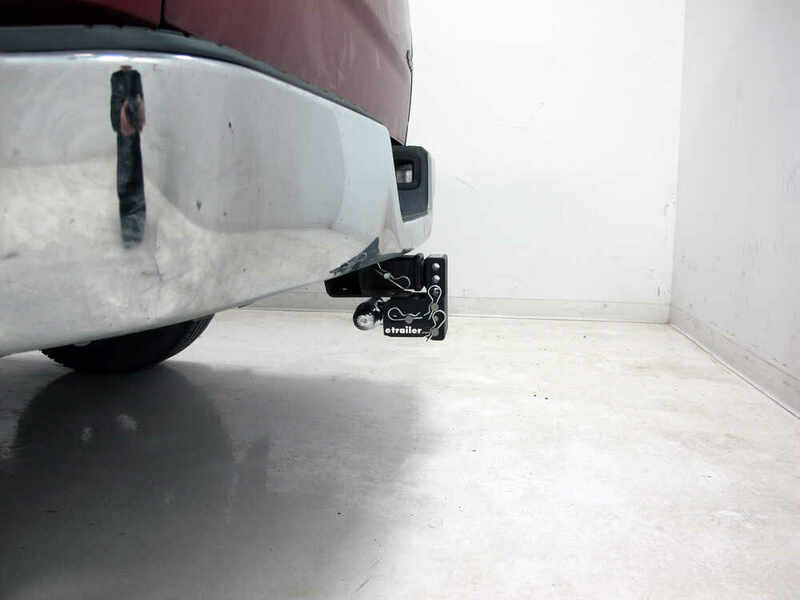 This is a great feature to have because it's going to provide that flush flat look on the back of your vehicle and then also when walking around the backside of your vehicle, you don't have to worry about banging your shins on the hitch balls. We'll go ahead and bring it out to it's loading position and another great feature is that we can actually adjust this to different heights. This is going to let us tow different trailers of different sizes and still be able to use the same vehicle. All you got to do is slide the ball mount up or down along the shank and then secure it in place when you find the desired height. The holes from the center of one hole to the next is one inch which means that you can adjust this an increments of one inch to best suite whatever it is that you are towing. 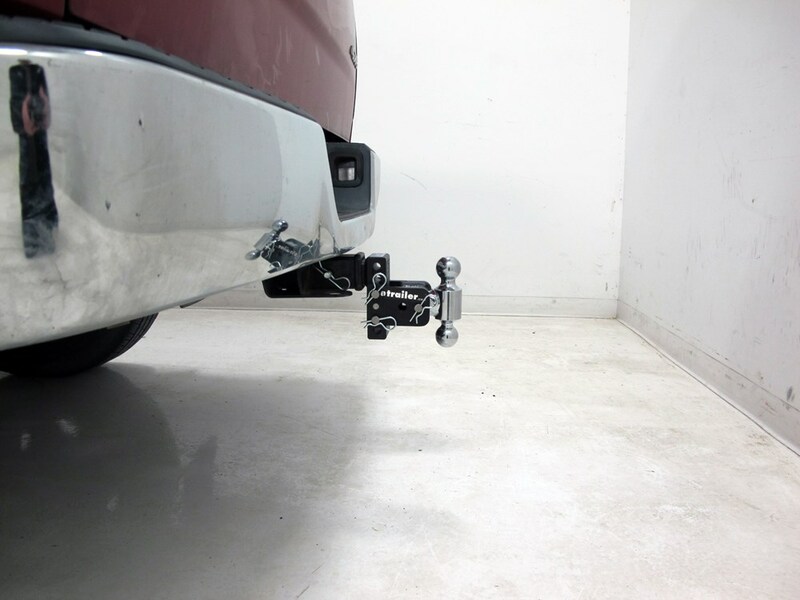 Once we have the desired height, we'll reinsert your pins, secure it with the clips, and what you also notice that it has two different hitch balls. This is going to be able to let you tow trailers with different coupler sizes. 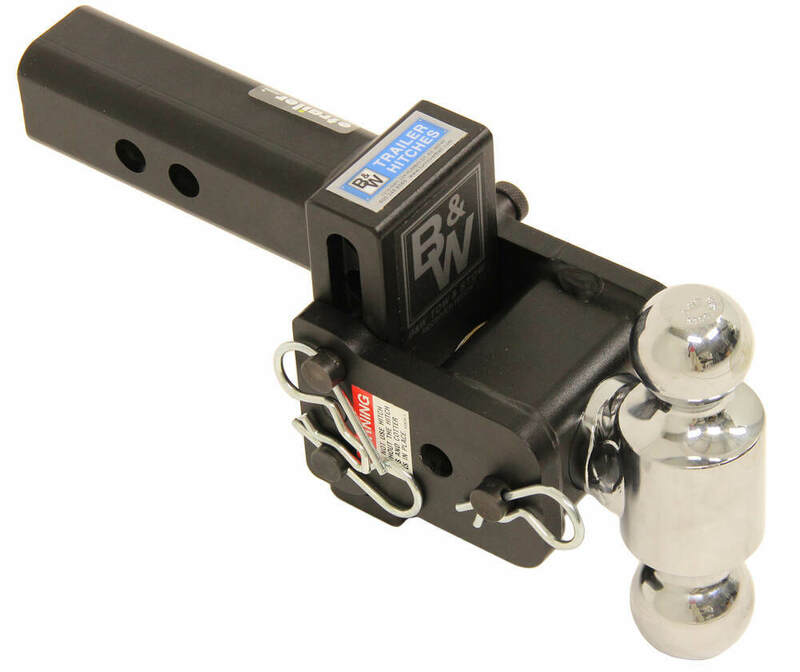 To switch between the different balls, you would pull the pin and clip and then you can rotate them as necessary to best suite your towing application. Once you have the desired one, you can go ahead and reinsert your pin and secure with the clip on the other side and then you are ready to tow. Now they do have a dual process chrome plating that provides excellent rust resistance and a black powder coated shank is also corrosion resistant. We have this stainless steel pins that are going to help create good sturdy rust proof connection points and then the durable steel construction with the high yield tubing is going to offer superior strength. 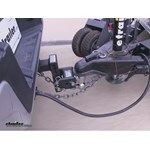 Now this is designed to work with the two inch by two inch trailer hitch receiver. When using the one to seven eight inch ball, you now have a gross towing weight of 3,500 pounds. When using the two inch ball, you're going to have a gross towing weight of 7,500 pounds. Now earlier I did mention that we have two different hitch pin hole locations. What I would like to do is take a measurement from the center of that hole to the center of our hitch ball. With it lined up with the hole that's closest to our hitch ball, we have a measurement of nine and a quarter inches from the center of that hole to the center of the hitch ball and then when we scoot this out to the other hole, we are going to have a measurement of right around 10 and a half inches. Now this ball mount is also easy to flip over the rise position and with it in it's highest setting in the rise position, we are going to have a maximum rise of three and a half inches. Within it's drop position at the lowest setting, we are going to have a maximum drop of three inches. And again it does move in increments of one inch and it comes with a limited one year warranty. That's going to complete today's review of part number BWTS10035B. 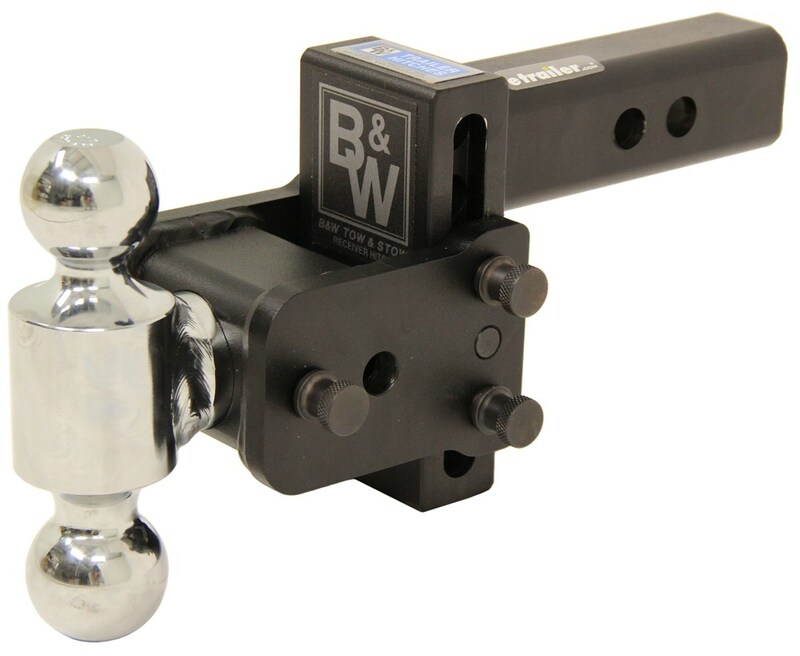 The B&W Tow and Stow two ball mount for two inch hinges. .
Can 2015 Lexus GX 460 Tow 6,500 lbs with Aftermarket Hitch?